“The worrisome thing about the GDP report is where the weakness was. Consumer spending grew at just a 0.3% annual rate—its slowest showing since the fourth quarter of 2009… As confirmed by soft monthly retail sales and the drop off in car sales, the first-quarter spending slowdown was real“. The problem is simple. Economic policy since 2000 under both Democrat and Republican Presidents has been dominated by wishful thinking, as I discussed in my Financial Times letter last week. Policymakers should have focused on demographics after 2001, as the oldest Boomers (born in 1946) began to join the low-spending, low-earning New Old 55+ generation. The budget surplus created during the SuperCycle should have been saved to fund future needs such as Social Security costs. 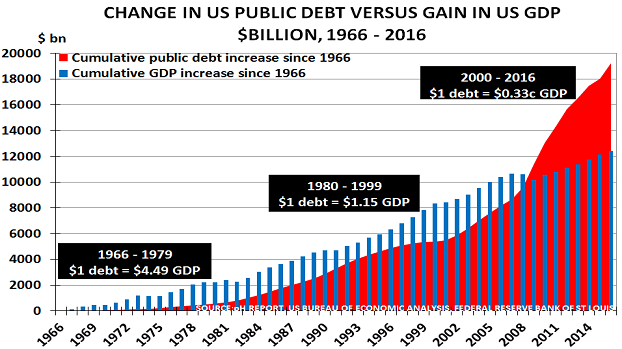 But instead, President George W Bush and the Federal Reserve wasted the surplus on futile stimulus policies based on tax cuts and low interest rates. And when this wishful thinking led to the 2008 financial crisis, President Obama and the Fed doubled down with even lower interest rates and $4tn of money-printing via quantitative easing.